3.An energy rating index (ERI) approach in Section R406. 1.Not more than one-half of the occupied space is air conditioned. 2.The occupied space is not heated. 3.Solar, wind or other renewable energy source supplies not less than 80 percent of the energy for service water heating. 4.Glazing in conditioned space has a solar heat gain coefficient of less than or equal to 0.40, or has an overhang with a projection factor equal to or greater than 0.30. 5.Permanently installed lighting is in accordance with Section R404. 6.The exterior roof surface complies with one of the options in Table C402.3 or the roof/ceiling has insulation with an R-value of R-15 or greater. If present, attics above the insulation are vented and attics below the insulation are unvented. 7.Roof surfaces have a minimum slope of 1/4 inch per foot of run. The finished roof does not have water accumulation areas. 8.Operable fenestration provides ventilation area equal to not less than 14 percent of the floor area in each room. Alternatively, equivalent ventilation is provided by a ventilation fan. 9.Bedrooms with exterior walls facing two different directions have operable fenestration. 10.Interior doors to bedrooms are capable of being secured in the open position. 11.A ceiling fan or ceiling fan rough-in is provided for bedrooms and the largest space that is not used as a bedroom. R401.3Energy performance level (EPL) display card (Mandatory). The building official shall require that an energy performance level (EPL) display card be completed and certified by the builder to be accurate and correct before final approval of the building for occupancy. Florida law (Section 553.9085, Florida Statutes) requires the EPL display card to be included as an addendum to each sales contract for both presold and nonpresold residential buildings. The EPL display card contains information indicating the energy performance level and efficiencies of components installed in a dwelling unit. The building official shall verify that the EPL display card completed and signed by the builder accurately reflects the plans and specifications submitted to demonstrate code compliance for the building. A copy of the EPL display card can be found in Appendix RD. The building thermal envelope shall meet the requirements of Sections R402.1.1 through R402.1.5. Exception: The following low-energy buildings, or portions thereof, separated from the remainder of the building by building thermal envelope assemblies complying with this section shall be exempt from the building thermal envelope provisions of Section R402. 1.Those with a peak design rate of energy usage less than 3.4 Btu/h · ft2 (10.7 W/m2) or 1.0 watt/ft2 of floor area for space-conditioning purposes. 2.Those that do not contain conditioned space. Wall assemblies in the building thermal envelope shall comply with the vapor retarder requirements of Section R702.7 of the Florida Building Code, Residential or Section 1405.3 of the Florida Building Code, Building, as applicable. The building thermal envelope shall meet the requirements of Table R402.1.2, based on the climate zone specified in Chapter 3.
a.R-values are minimums. U-factors and SHGC are maximums. When insulation is installed in a cavity which is less than the label or design thickness of the insulation, the installed R-value of the insulation shall not be less than the R-value specified in the table. b.The fenestration U-factor column excludes skylights. The SHGC column applies to all glazed fenestration. Exception: Skylights may be excluded from glazed fenestration SHGC requirements in climate zones 1 through 3 where the SHGC for such skylights does not exceed 0.30.
c.“15/19” means R-15 continuous insulation on the interior or exterior of the home or R-19 cavity insulation at the interior of the basement wall. “15/19” shall be permitted to be met with R-13 cavity insulation on the interior of the basement wall plus R-5 continuous insulation on the interior or exterior of the home. “10/13” means R-10 continuous insulation on the interior or exterior of the home or R-13 cavity insulation at the interior of the basement wall. d.R-5 shall be added to the required slab edge R-values for heated slabs. Insulation depth shall be the depth of the footing or 2 feet, whichever is less in Climate Zones 1 through 3 for heated slabs. e.There are no SHGC requirements in the Marine Zone. f.Basement wall insulation is not required in warm-humid locations as defined by Figure R301.1 and Table R301.1. g.Or insulation sufficient to fill the framing cavity, R-19 minimum. h.The first value is cavity insulation, the second value is continuous insulation, so “13+5” means R-13 cavity insulation plus R-5 continuous insulation. i.The second R-value applies when more than half the insulation is on the interior of the mass wall. j.For impact rated fenestration complying with Section R301.2.1.2 of the Florida Building Code, Residential or Section 1609.1.2 of the Florida Building Code, Building, the maximum U-factor shall be 0.65 in Climate Zone 2. Insulation material used in layers, such as framing cavity insulation, or continuous insulation shall be summed to compute the corresponding component R-value. The manufacturer’s settled R-value shall be used for blown insulation. Computed R-values shall not include an R-value for other building materials or air films. Where insulated siding is used for the purpose of complying with the continuous insulation requirements of Table R402.1.2, the manufacturer’s labeled R-value for insulated siding shall be reduced by R-0.6. An assembly with a U-factor equal to or less than that specified in Table R402.1.4 shall be permitted as an alternative to the R-value in Table R402.1.2. a.Nonfenestration U-factors shall be obtained from measurement, calculation or an approved source. b.When more than half the insulation is on the interior, the mass wall U-factors shall be a maximum of 0.17 in Climate Zone 1, 0.14 in Climate Zone 2, 0.12 in Climate Zone 3, 0.087 in Climate Zone 4 except Marine, 0.065 in Climate Zone 5 and Marine 4, and 0.057 in Climate Zones 6 through 8.
c.Basement wall U-factor of 0.360 in warm-humid locations as defined by Table R301.1. If the total building thermal envelope UA (sum of U-factor times assembly area) is less than or equal to the total UA resulting from using the U-factors in Table R402.1.4 (multiplied by the same assembly area as in the proposed building), the building shall be considered in compliance with Table R402.1.2. The UA calculation shall be done using a method consistent with the ASHRAE Handbook of Fundamentals and shall include the thermal bridging effects of framing materials. The SHGC requirements shall be met in addition to UA compliance. In addition to the requirements of Section R402.1, insulation shall meet the specific requirements of Sections R402.2.1 through R402.2.13. Where Section R402.1.2 would require R-38 insulation in the ceiling, installing R-30 over 100 percent of the ceiling area requiring insulation shall be deemed to satisfy the requirement for R-38 wherever the full height of uncompressed R-30 insulation extends over the wall top plate at the eaves. Similarly, where Section R402.1.2 would require R-49 insulation in the ceiling, installing R-38 over 100 percent of the ceiling area requiring insulation shall be deemed to satisfy the requirement for R-49 insulation wherever the full height of uncompressed R-38 insulation extends over the wall top plate at the eaves. This reduction shall not apply to the U-factor alternative approach in Section R402.1.4 and the total UA alternative in Section R402.1.5. Where Section R402.1.2 would require insulation levels above R-30 and the design of the roof/ceiling assembly does not allow sufficient space for the required insulation, the minimum required insulation for such roof/ceiling assemblies shall be R-30. This reduction of insulation from the requirements of Section R402.1.2 shall be limited to 500 square feet (46 m2) or 20 percent of the total insulated ceiling area, whichever is less. This reduction shall not apply to the U-factor alternative approach in Section R402.1.4 and the total UA alternative in Section R402.1.5. Access doors from conditioned spaces to unconditioned spaces such as attics and crawl spaces shall be weatherstripped and insulated to a level equivalent to the insulation on the surrounding surfaces. Access shall be provided to all equipment that prevents damaging or compressing the insulation. A woodframed or equivalent baffle or retainer is required to be provided when loose-fill insulation is installed, the purpose of which is to prevent the loose-fill insulation from spilling into the living space when the attic access is opened, and to provide a permanent means of maintaining the installed R-value of the loose-fill insulation. Exception: Vertical doors that provide access from conditioned to unconditioned spaces shall be permitted to meet the fenestration requirements of Table R402.1.2 based on the applicable climate zone specified in Chapter 3. Mass walls for the purposes of this chapter shall be considered above-grade walls of concrete block, concrete, insulated concrete form (ICF), masonry cavity, brick (other than brick veneer), earth (adobe, compressed earth block, rammed earth) and solid timber/logs, or any other walls having a heat capacity greater than or equal to 6 Btu/ft2 · °F (123 kJ/m2 · K). R402.2.6Steel-frame ceilings, walls and floors. Steel-frame ceilings, walls, and floors shall meet the insulation requirements of Table R402.2.6 or shall meet the U-factor requirements of Table R402.1.4. The calculation of the U-factor for a steel-frame envelope assembly shall use a series-parallel path calculation method. aCavity insulation R-value is listed first, followed by continuous insulation R-value. b.Insulation exceeding the height of the framing shall cover the framing. R402.2.7Walls with partial structural sheathing. Where Section R402.1.2 would require continuous insulation on exterior walls and structural sheathing covers 40 percent or less of the gross area of all exterior walls, the continuous insulation R-value shall be permitted to be reduced by an amount necessary to result in a consistent total sheathing thickness, but not more than R-3, on areas of the walls covered by structural sheathing. This reduction shall not apply to the U-factor alternative approach in Section R402.1.4 and the total UA alternative in Section R402.1.5. Exception: The floor framing-cavity insulation shall be permitted to be in contact with the topside of sheathing or continuous insulation installed on the bottom side of floor framing where combined with insulation that meets or exceeds the minimum wood frame wall R-value in Table 402.1.2 and that extends from the bottom to the top of all perimeter floor framing members. Walls associated with conditioned basements shall be insulated from the top of the basement wall down to 10 feet (3048 mm) below grade or to the basement floor, whichever is less. Walls associated with unconditioned basements shall meet this requirement unless the floor overhead is insulated in accordance with Sections R402.1.2 and R402.2.8. Slab-on-grade floors with a floor surface less than 12 inches (305 mm) below grade shall be insulated in accordance with Table R402.1.2. The insulation shall extend downward from the top of the slab on the outside or inside of the foundation wall. Insulation located below grade shall be extended the distance provided in Table R402.1.2 by any combination of vertical insulation, insulation extending under the slab or insulation extending out from the building. Insulation extending away from the building shall be protected by pavement or by not less than 10 inches (254 mm) of soil. The top edge of the insulation installed between the exterior wall and the edge of the interior slab shall be permitted to be cut at a 45-degree (0.79 rad) angle away from the exterior wall. Slabedge insulation is not required in jurisdictions designated by the code official as having a very heavy termite infestation. As an alternative to insulating floors over crawl spaces, crawl space walls shall be permitted to be insulated when the crawl space is not vented to the outside. Crawl space wall insulation shall be permanently fastened to the wall and extend downward from the floor to the finished grade level and then vertically and/or horizontally for at least an additional 24 inches (610 mm). Exposed earth in unvented crawl space foundations shall be covered with a continuous Class I vapor retarder in accordance with the Florida Building Code, Building, or Florida Building Code, Residential, as applicable. All joints of the vapor retarder shall overlap by 6 inches (153 mm) and be sealed or taped. The edges of the vapor retarder shall extend not less than 6 inches (153 mm) up the stem wall and shall be attached to the stem wall. Sunrooms enclosing conditioned space shall meet the insulation requirements of this code. 1.The minimum ceiling insulation R-values shall be R-19 in Climate Zones 1 through 4 and R-24 in Climate Zones 5 through 8. 2.The minimum wall R-value shall be R-13 in all climate zones. Walls separating a sunroom with a thermal isolation from conditioned space shall meet the building thermal envelope requirements of this code. Walls, ceilings or floors common to separate conditioned tenancies shall be insulated to a minimum R-11, space permitting. Exception: Mass common walls shall be insulated to a minimum of R-6. In addition to the requirements of Section R402, fenestration shall comply with Sections R402.3.1 through R402.3.5. Dynamic glazing shall be permitted to satisfy the SHGC requirements of Table R402.1.2 provided the ratio of the higher to lower labeled SHGC is greater than or equal to 2.4, and the dynamic glazing is automatically controlled to modulate the amount of solar gain into the space in multiple steps. Dynamic glazing shall be considered separately from other fenestration, and area-weighted averaging with other fenestration that is not dynamic glazing shall not be permitted. Exception: Dynamic glazing is not required to comply with this section when both the lower and higher labeled SHGC already comply with the requirements of Table R402.1.2. Up to 15 square feet (1.4 m2) of glazed fenestration per dwelling unit shall be permitted to be exempt from U-factor and SHGC requirements in Section R402.1.2. This exemption shall not apply to the U-factor alternative approach in Section R402.1.4 and the Total UA alternative in Section R402.1.5. One side-hinged opaque door assembly up to 24 square feet (2.22 m2) in area is exempted from the U-factor requirement in Section R402.1.4. This exemption shall not apply to the U-factor alternative approach in Section R402.1.4 and the total UA alternative in Section R402.1.5. The building thermal envelope shall be constructed to limit air leakage in accordance with the requirements of Sections R402.4.1 through R402.4.5. Exception: Dwelling units of R-2 Occupancies and multiple attached single family dwellings shall be permitted to comply with Section C402.5. General requirements A continuous air barrier shall be installed in the building envelope.The exterior thermal envelope contains a continuous air barrier.Breaks or joints in the air barrier shall be sealed. Air-permeable insulation shall not be used as a sealing material. Ceiling/attic The air barrier in any dropped ceiling/soffit shall be aligned with the insulation and any gaps in the air barrier shall be sealed. Access openings, drop down stairs or knee wall doors to unconditioned attic spaces shall be sealed. The insulation in any dropped ceiling/soffit shall be aligned with the air barrier. Walls The junction of the foundation and sill plate shall be sealed. The junction of the top plate and the top of exterior walls shall be sealed. Knee walls shall be sealed. Cavities within corners and headers of frame walls shall be insulated by completely filling the cavity with a material having a thermal resistance of R-3 per inch minimum. Exterior thermal envelope insulation for framed walls shall be installed in substantial contact and continuous alignment with the air barrier. Windows, skylights and doors The space between window/door jambs and framing, and skylights and framing shall be sealed. Floors (including above garage and cantilevered floors) The air barrier shall be installed at any exposed edge of insulation. Floor framing cavity insulation shall be installed to maintain permanent contact with the underside of subfloor decking, or floor framing cavity insulation shall be permitted to be in contact with the top side of sheathing, or continuous insulation installed on the underside of floor framing and extends from the bottom to the top of all perimeter floor framing members. Crawl space walls Exposed earth in unvented crawl spaces shall be covered with a Class I vapor retarder with overlapping joints taped. Where provided instead of floor insulation, insulation shall be permanently attached to the crawlspace walls. Recessed lighting Recessed light fixtures installed in the building thermal envelope shall be sealed to the drywall. Recessed light fixtures installed in the building thermal envelope shall be air tight and IC rated. Shower/tub on exterior wall The air barrier installed at exterior walls adjacent to showers and tubs shall separate them from the showers and tubs. Exterior walls adjacent to showers and tubs shall be insulated. Concealed sprinklers When required to be sealed, concealed fire sprinklers shall only be sealed in a manner that is recommended by the manufacturer. Caulking or other adhesive sealants shall not be used to fill voids between fire sprinkler cover plates and walls or ceilings. a.In addition, inspection of log walls shall be in accordance with the provisions of ICC-400. The building or dwelling unit shall be tested and verified as having an air leakage rate not exceeding seven air changes per hour in Climate Zones 1 and 2, and three air changes per hour in Climate Zones 3 through 8. Testing shall be conducted in accordance with ANSI/RESNET/ICC 380 and reported at a pressure of 0.2 inch w.g. (50 pascals). Testing shall be conducted by either individuals as defined in Section 553.993(5) or (7), Florida Statutes, or individuals licensed as set forth in Section 489.105(3)(f), (g) or (i) or an approved third party. A written report of the results of the test shall be signed by the party conducting the test and provided to the code official. Testing shall be performed at any time after creation of all penetrations of the building thermal envelope. Exception: Testing is not required for additions, alterations, renovations or repairs of the building thermal envelope of existing buildings in which the new construction is less than 85 percent of the building thermal envelope. 1.Exterior windows and doors, fireplace and stove doors shall be closed, but not sealed, beyond the intended weatherstripping or other infiltration control measures. 2.Dampers including exhaust, intake, makeup air, backdraft and flue dampers shall be closed, but not sealed beyond intended infiltration control measures. 3.Interior doors, if installed at the time of the test, shall be open. 4.Exterior doors for continuous ventilation systems and heat recovery ventilators shall be closed and sealed. 5.Heating and cooling systems, if installed at the time of the test, shall be turned off. 6.Supply and return registers, if installed at the time of the test, shall be fully open. In Climate Zones 3 through 8, where open combustion air ducts provide combustion air to open combustion fuel burning appliances, the appliances and combustion air opening shall be located outside the building thermal envelope or enclosed in a room, isolated from inside the thermal envelope. Such rooms shall be sealed and insulated in accordance with the envelope requirements of Table R402.1.2, where the walls, floors and ceilings shall meet not less than the basement wall R-value requirement. The door into the room shall be fully gasketed and any water lines and ducts in the room insulated in accordance with Section R403. The combustion air duct shall be insulated where it passes through conditioned space to a minimum of R-8. 1.Direct vent appliances with both intake and exhaust pipes installed continuous to the outside. 2.Fireplaces and stoves complying with Section R402.4.2 and Section R1006 of the Florida Building Code, Residential. Recessed luminaires installed in the building thermal envelope shall be sealed to limit air leakage between conditioned and unconditioned spaces. All recessed luminaires shall be IC-rated and labeled as having an air leakage rate not more than 2.0 cfm (0.944 L/s) when tested in accordance with ASTM E283 at a 1.57 psf (75 Pa) pressure differential. All recessed luminaires shall be sealed with a gasket or caulk between the housing and the interior wall or ceiling covering. R403.1.3Heat pump supplementary heat (Mandatory). R403.2Hot water boiler outdoor temperature setback. Ducts and air handlers shall be in accordance with Sections R403.3.1 through R403.3.5. Supply and return ducts in attics shall be insulated to a minimum of R-8 where 3 inches (76 mm) in diameter and greater and R-6 where less than 3 inches (76 mm) in diameter. Supply and return ducts in other portions of the building shall be insulated to a minimum of R-6 where 3 inches (76 mm) in diameter or greater and R-4.2 where less than 3 inches (76 mm) in diameter. All ducts, air handlers, filter boxes and building cavities that form the primary air containment passageways for air distribution systems shall be considered ducts or plenum chambers, shall be constructed and sealed in accordance with Section C403.2.9.2 of the Commercial Provisions of this code and shall be shown to meet duct tightness criteria below. Duct tightness shall be verified by testing in accordance with ANSI/RESNET/ICC 380 by either individuals as defined in Section 553.993(5) or (7), Florida Statutes, or individuals licensed as set forth in Section 489.105(3)(f), (g) or (i), Florida Statutes, to be “substantially leak free” in accordance with Section R403.3.3. Air handlers shall have a manufacturer’s designation for an air leakage of no more than 2 percent of the design airflow rate when tested in accordance with ASHRAE 193. 1.Rough-in test: Total leakage shall be measured with a pressure differential of 0.1 inch w.g. (25 Pa) across the system, including the manufacturer’s air handler enclosure if installed at the time of the test. All registers shall be taped or otherwise sealed during the test. 2.Postconstruction test: Total leakage shall be measured with a pressure differential of 0.1 inch w.g. (25 Pa) across the entire system, including the manufacturer’s air handler enclosure. Registers shall be taped or otherwise sealed during the test. 1.A duct air leakage test shall not be required where the ducts and air handlers are located entirely within the building thermal envelope. 2.Duct testing is not mandatory for buildings complying by Section 405 of this code. 1.Rough-in test: The total leakage shall be less than or equal to 4 cubic feet per minute (113.3 L/min) per 100 square feet (9.29 m2) of conditioned floor area where the air handler is installed at the time of the test. Where the air handler is not installed at the time of the test, the total leakage shall be less than or equal to 3 cubic feet per minute (85 L/min) per 100 square feet (9.29 m2) of conditioned floor area. 2.Postconstruction test: Total leakage shall be less than or equal to 4 cubic feet per minute (113.3 L/min) per 100 square feet (9.29 m2) of conditioned floor area. 1.The service panel of the equipment is located within 6 feet (1829 mm) of an attic access. 2.A device is installed to alert the owner or shut down the unit when the condensation drain is not working properly. 3. The attic access opening is of sufficient size to replace the air handler. A PART OF YOUR AIR-CONDITIONING SYSTEM, THE AIR HANDLER, IS LOCATED IN THE ATTIC. FOR PROPER, EFFICIENT AND ECONOMIC OPERATION OF THE AIRCONDITIONING SYSTEM, YOU MUST ENSURE THAT REGULAR MAINTENANCE IS PERFORMED. YOUR AIR-CONDITIONING SYSTEM IS EQUIPPED WITH ONE OR BOTH OF THE FOLLOWING: (1) A DEVICE THAT WILL ALERT YOU WHEN THE CONDENSATION DRAIN IS NOT WORKING PROPERLY OR (2) A DEVICE THAT WILL SHUT DOWN THE SYSTEM WHEN THE CONDENSATION DRAIN IS NOT WORKING. TO LIMIT POTENTIAL DAMAGE TO YOUR HOME, AND TO AVOID DISRUPTION OF SERVICE, IT IS RECOMMENDED THAT YOU ENSURE PROPER WORKING ORDER OF THESE DEVICES BEFORE EACH SEASON OF PEAK OPERATION. R403.4Mechanical system piping insulation (Mandatory). Energy conservation measures for service hot water systems shall be in accordance with Sections R403.5.1 through R403.5.6. R403.5.1Heated water circulation and temperature maintenance systems (Mandatory). Heated water circulation systems shall be provided with a circulation pump. The system return pipe shall be a dedicated return pipe or a cold water supply pipe. Gravity and thermosyphon circulation systems shall be prohibited. Controls for circulating hot water system pumps shall start the pump based on the identification of a demand for hot water within the occupancy. The controls shall automatically turn off the pump when the water in the circulation loop is at the desired temperature and when there is no demand for hot water. 1.The control shall start the pump upon receiving a signal from the action of a user of a fixture or appliance, sensing the presence of a user of a fixture or sensing the flow of hot or tempered water to a fixture fitting or appliance. 2.The control shall limit the temperature of the water entering the cold water piping to 104°F (40°C). R403.5.3Hot water pipe insulation (Prescriptive). 1.Piping 3/4 inch (19.1 mm) and larger in nominal diameter. 2.Piping serving more than one dwelling unit. 3.Piping located outside the conditioned space. 4.Piping from the water heater to a distribution manifold. 5.Piping located under a floor slab. 7.Supply and return piping in recirculation systems other than demand recirculation systems. R403.5.4Drain water heat recovery units. Storage water heaters not equipped with integral heat traps and having vertical pipe risers shall have heat traps installed on both the inlets and outlets. External heat traps shall consist of either a commercially available heat trap or a downward and upward bend of at least 31/2 inches (89 mm) in the hot water distribution line and cold water line located as close as possible to the storage tank. R403.5.6.1Storage water heater temperature controls. Service water-heating systems shall be equipped with automatic temperature controls capable of adjustment from the lowest to the highest acceptable temperature settings for the intended use. The minimum temperature setting range shall be from 100°F to 140°F (38°C to 60°C). A separate switch or a clearly marked circuit breaker shall be provided to permit the power supplied to electric service systems to be turned off. A separate valve shall be provided to permit the energy supplied to the main burner(s) of combustion types of service water-heating systems to be turned off. Water-heating equipment installed in residential units shall meet the minimum efficiencies of Table C404.2 in Chapter 4 of the Florida Building Code, Energy Conservation, Commercial Provisions, for the type of equipment installed. Equipment used to provide heating functions as part of a combination system shall satisfy all stated requirements for the appropriate water-heating category. Solar water heaters shall meet the criteria of Section R403.5.6.2.1. 2.Be installed at an orientation within 45 degrees of true south. The building shall be provided with ventilation that meets the requirements of the Florida Building Code, Residential, or Florida Building Code, Mechanical, as applicable, or with other approved means of ventilation including: Natural, Infiltration or Mechanical means. Outdoor air intakes and exhausts shall have automatic or gravity dampers that close when the ventilation system is not operating. R403.6.1Whole-house mechanical ventilation system fan efficacy. When installed to function as a whole-house mechanical ventilation system, fans shall meet the efficacy requirements of Table R403.6.1. 1.The design air change per hour minimums for residential buildings in ASHRAE 62.2, Ventilation for Acceptable Indoor Air Quality, shall be the maximum rates allowed for residential applications. 2.No ventilation or air-conditioning system make-up air shall be provided to conditioned space from attics, crawlspaces, attached enclosed garages or outdoor spaces adjacent to swimming pools or spas. 3.If ventilation air is drawn from enclosed space(s), then the walls of the space(s) from which air is drawn shall be insulated to a minimum of R-11 and the ceiling shall be insulated to a minimum of R-19, space permitting, or R-10 otherwise. R403.7Heating and cooling equipment (Mandatory). Heating and cooling equipment shall be sized in accordance with ACCA Manual S based on the equipment loads calculated in accordance with ACCA Manual J or other approved heating and cooling calculation methodologies, based on building loads for the directional orientation of the building. The manufacturer and model number of the outdoor and indoor units (if split system) shall be submitted along with the sensible and total cooling capacities at the design conditions described in Section R302.1. This Code does not allow designer safety factors, provisions for future expansion or other factors that affect equipment sizing. System sizing calculations shall not include loads created by local intermittent mechanical ventilation such as standard kitchen and bathroom exhaust systems. New or replacement heating and cooling equipment shall have an efficiency rating equal to or greater than the minimum required by federal law for the geographic location where the equipment is installed. Cooling only equipment shall be selected so that its total capacity is not less than the calculated total load but not more than 1.15 times greater than the total load calculated according to the procedure selected in Section 403.7, or the closest available size provided by the manufacturer’s product lines. The corresponding latent capacity of the equipment shall not be less than the calculated latent load. The published value for AHRI total capacity is a nominal, rating-test value and shall not be used for equipment sizing. Manufacturer’s expanded performance data shall be used to select cooling-only equipment. This selection shall be based on the outdoor design dry-bulb temperature for the load calculation (or entering water temperature for water-source equipment), the blower CFM provided by the expanded performance data, the design value for entering wet-bulb temperature and the design value for entering dry-bulb temperature. Design values for entering wet-bulb and dry-bulb temperatures shall be for the indoor dry bulb and relative humidity used for the load calculation and shall be adjusted for return side gains if the return duct(s) is installed in an unconditioned space. 1.Attached single- and multiple-family residential equipment sizing may be selected so that its cooling capacity is less than the calculated total sensible load but not less than 80 percent of that load. 2.When signed and sealed by a Florida-registered engineer, in attached single- and multiple-family units, the capacity of equipment may be sized in accordance with good design practice. Heat pump sizing shall be based on the cooling requirements as calculated according to Section R403.7.1.1, and the heat pump total cooling capacity shall not be more than 1.15 times greater than the design cooling load even if the design heating load is 1.15 times greater than the design cooling load. Electric resistance furnaces shall be sized within 4 kW of the design requirements calculated according to the procedure selected in Section R403.7.1. R403.7.1.2.3 Fossil fuel heating equipment. The capacity of fossil fuel heating equipment with natural draft atmospheric burners shall not be less than the design load calculated in accordance with Section R403.7.1. R403.7.1.3 Extra capacity required for special occasions. 1.A separate cooling or heating system is utilized to provide cooling or heating to the major entertainment areas. 2.A variable capacity system sized for optimum performance during base load periods is utilized. R403.8Systems serving multiple dwelling units (Mandatory). Systems serving multiple dwelling units shall comply with Sections C403 and C404 of the IECC—Commercial Provisions in lieu of Section R403. R403.9Snow melt and ice system controls (Mandatory). R403.10Pools and permanent spa energy consumption (Mandatory). The energy consumption of pools and permanent spas shall be in accordance with Sections R403.10.1 through R403.10.5. 1.Where public health standards require 24-hour pump operation. 2.Pumps that operate solar- and waste-heat-recovery pool heating systems. 3.Where pumps are powered exclusively from onsite renewable generation. Outdoor heated swimming pools and outdoor permanent spas shall be equipped with a vapor-retardant cover on or at the water surface or a liquid cover or other means proven to reduce heat loss. R403.10.4Gas- and oil-fired pool and spa heaters. All gas- and oil-fired pool and spa heaters shall have a minimum thermal efficiency of 82 percent for heaters manufactured on or after April 16, 2013, when tested in accordance with ANSI Z 21.56. Pool heaters fired by natural or LP gas shall not have continuously burning pilot lights. Heat pump pool heaters shall have a minimum COP of 4.0 when tested in accordance with AHRI 1160, Table 2, Standard Rating Conditions-Low Air Temperature. A test report from an independent laboratory is required to verify procedure compliance. Geothermal swimming pool heat pumps are not required to meet this standard. R403.12Residential pools and permanent residential spas. Residential swimming pools and permanent residential spas that are accessory to detached one- and two-family dwellings and townhouses three stories or less in height above grade plane and that are available only to the household and its guests shall be in accordance with APSP-15. Ceilings shall have an insulation level of at least R-19, space permitting. For the purposes of this code, types of ceiling construction that are considered to have inadequate space to install R-19 include single assembly ceilings of the exposed deck and beam type and concrete deck roofs. Such ceiling assemblies shall be insulated to at least a level of R-10. Compliance based on simulated energy performance requires that a proposed residence (proposed design) be shown to have annual total normalized Modified Loads that are less than or equal to the annual total loads of the standard reference design as calculated in accordance with Appendix RC of this standard. Computer software utilized for demonstration of code compliance shall have been approved by the Florida Building Commission in accordance with requirements of this code. Compliance software tools shall generate a report that documents that the proposed design complies with Section R405.3. A compliance report on the proposed design shall be submitted with the application for the building permit. Upon completion of the building, a compliance report based on the as-built condition of the building shall be submitted to the code official before a certificate of occupancy is issued. Batch sampling of buildings to determine energy code compliance for all buildings in the batch shall be prohibited. Compliance reports shall include information in accordance with Sections R405.4.2.1 and R405.4.2.2. Where the proposed design of a building could be built on different sites where the cardinal orientation of the building on each site is different, compliance of the proposed design for the purposes of the application for the building permit shall be based on the worst-case orientation, worst-case configuration, worst-case building air leakage and worst- case duct leakage. Such worst-case parameters shall be used as inputs to the compliance software for energy analysis. R405.4.2.1Compliance report for permit application. 1.Building street address, or other building site identification. 2.A statement indicating that the proposed design complies with Section R405.3. 3.An inspection checklist documenting the building component characteristics of the proposed design as indicated in Table R405.5.2(1). The inspection checklist shall show results for the proposed design with user inputs to the compliance software to generate the results. 4.A site-specific energy analysis report that is in compliance with Section R405.3. 5.The name of the individual performing the analysis and generating the report. 6.The name and version of the compliance software tool. Exception: Multiple orientations. When an otherwise identical building model is offered in multiple orientations, compliance for any orientation shall be permitted by documenting that the building meets the performance requirements in each of the four cardinal (north, east, south and west) orientations, or the “Worst” orientation. Compliance software tools may calculate the “Worst Case” orientation by rotating the building through the 4 or 8 cardinal orientations. R405.4.2.2Compliance report for certificate of occupancy. 2.A statement indicating that the as-built building complies with Section R405.3. 3.A certificate indicating that the building passes the performance matrix for code compliance and listing the energy saving features of the buildings. 1.Verification that an EPL display card signed by the builder providing the building component characteristics of the proposed design will be provided to the purchaser of the home at time of title transfer. 2.Documentation of the component efficiencies used in the software calculations for the proposed design. Calculations of the performance design shall be in accordance with Sections R405.5.1 through R405.5.3. The standard reference design and proposed design shall be configured and analyzed as specified by Table R405.5.2(1). Table R405.5.2(1) shall include, by reference, all notes contained in Table R402.1.2. Energy recovery shall not be assumed for mechanical ventilation. The measured air exchange ratea.The mechanical ventilation rateb shall be in addition to the air leakage rate and shall be as proposed. Internal mass An internal mass for furniture and contents of8 pounds per square foot of floor area Same as standard reference design, plus any additional mass specifically designed as a thermal storage elementc but not integral to the building envelope or structure. Thermal distribution systems Distribution system efficiency: 0.88 Thermal distribution system efficiency shall be as tested in accordance with ANSI/RESNET/ICC 380 or if not tested, shall be modeled as a Qn to outside of 0.080 for ducted systems. Hydronic and ductless systems shall be as specified in Table R405.5.2(2) if not tested. a.Where required by the code official, testing shall be conducted by an approved party. Hourly calculations as specified in the ASHRAE Handbook of Fundamentals, or the equivalent shall be used to determine the energy loads resulting from infiltration. b.The combined air exchange rate for infiltration and mechanical ventilation shall be determined in accordance with Equation 43 of 2001 ASHRAE Handbook of Fundamentals, page 26.24 and the “Whole-house Ventilation” provisions of 2001 ASHRAE Handbook of Fundamentals, page 26.19 for intermittent mechanical ventilation. c.Thermal storage element shall mean a component not part of the floors, walls or ceilings that is part of a passive solar system, and that provides thermal storage such as enclosed water columns, rock beds, or phase-change containers. A thermal storage element must be in the same room as fenestration that faces within 15 degrees (0.26 rad) of true south, or must be connected to such a room with pipes or ducts that allow the element to be actively charged. d.For a proposed design with multiple heating, cooling or water heating systems using different fuel types, the applicable standard reference design system capacities and fuel types shall be weighted in accordance with their respective loads as calculated by accepted engineering practice for each equipment and fuel type present. e.For a proposed design without a proposed heating system, a heating system with the prevailing federal minimum efficiency shall be assumed for both the standard reference design and proposed design. f.For a proposed design home without a proposed cooling system, an electric air conditioner with the prevailing federal minimum efficiency shall be assumed for both the standard reference design and the proposed design. g.For a proposed design with a nonstorage-type water heater, a 40-gallon storage-type water heater with the prevailing federal minimum energy factor for the same fuel as the predominant heating fuel type shall be assumed. For the case of a proposed design without a proposed water heater, a 40-gallon storage-type water heater with the prevailing federal minimum efficiency for the same fuel as the predominant heating fuel type shall be assumed for both the proposed design and standard reference design. AF = Total fenestration area. As = Standard reference design total fenestration area. For SI: 1 cubic foot per minute = 0.47 L/s, 1 square foot = 0.093 m2, 1 pound per square inch = 6895 Pa, 1 inch water gauge = 1250 Pa.
a.Default values given by this table are for untested distribution systems, which must still meet minimum requirements for duct system insulation. b.Hydronic systems shall mean those systems that distribute heating and cooling energy directly to individual spaces using liquids pumped through closed-loop piping and that do not depend on ducted, forced airflow to maintain space temperatures. c.Entire system in conditioned space shall mean that no component of the distribution system, including the air-handler unit, is located outside of the conditioned space. d.Ductless systems shall be allowed to have forced airflow across a coil but shall not have any ducted airflow external to the manufacturer’s air-handler enclosure. All glazing areas of a residence, including windows, sliding glass doors, glass in doors, skylights, etc., shall include the manufacturer’s frame area in the total window area. Window measurements shall be as specified on the plans and specifications for the residence. Exception: When a window in existing exterior walls is enclosed by an addition, an amount equal to the area of this window may be subtracted from the glazing area for the addition for that overhang and orientation. Overhang effect is measured by Overhang Separation, which is the vertical measure of the distance from the top of a window to the bottom of the overhang. The overhang for adjustable exterior shading devices shall be determined at its most extended position. Nonpermanent shading devices such as canvas awnings shall not be considered overhangs. Permanently attached wood and metal awnings may be considered overhangs. For doors that are opaque or where the glass is less than one-third of the area of the door, the total door area shall be included in the door calculation. For unlabeled sliding glass doors or when glass areas in doors are greater than or equal to one-third of the area of the door, the glazing portion shall be included in the glazing calculation and the opaque portion of the door shall be included in the door calculation. When glass areas in doors are greater than or equal to one-third of the area of the door, the door shall be included in the glazing calculation as a total fenestration using the tested U-factor and solar heat gain coefficient. The Proposed Design must have either an area-weighted average maximum fenestration SHGC of 0.50 or a window area-weighted average overhang depth of 4.0 feet or greater (all conditioned space windows must be included in the calculation). The area-weighted average maximum fenestration U-factor permitted using tradeoffs from Section R402.1.5 or R405 shall be 0.48 in Climate Zones 4 and 5 and 0.40 in Climate Zones 6 through 8 for vertical fenestration, and 0.75 in Climate Zones 4 through 8 for skylights. The area-weighted average maximum fenestration SHGC permitted using tradeoffs from Section R405 in Climate Zones 1 through 3 shall be 0.50. 1.Computer generation of the standard reference design using only the input for the proposed design. The calculation procedure shall not allow the user to directly modify the building component characteristics of the standard reference design. 2.Calculation of whole-building (as a single zone) sizing for the heating and cooling equipment in the standard reference design residence in accordance with Section R403.6. 3.Calculations that account for the effects of indoor and outdoor temperatures and part-load ratios on the performance of heating, ventilating and air-conditioning equipment based on climate and equipment sizing. 4.Printed code official inspection checklist listing each of the proposed design component characteristics from Table R405.5.2(1) determined by the analysis to provide compliance, along with their respective performance ratings (R-value, U-factor, SHGC, HSPF, AFUE, SEER, EF are some examples). Performance analysis tools meeting the applicable provisions of Section R405 shall be permitted to be approved. Tools are permitted to be approved based on meeting a specified threshold for a jurisdiction. The code official shall be permitted to approve tools for a specified application or limited scope. When calculations require input values not specified by Sections R402, R403, R404 and R405, those input values shall be taken from an approved source. The Energy Factor (EF) of an instantaneous water heater [those with capacity of two gallons (7.57 L) or less] in the Proposed home shall be reduced to 92 percent of the value in the manufacturer’s documentation or AHRI Directory of Certified Product Performance. R405.7Requirements specific to credit options. Credit may be claimed in the software compliance calculation for technologies that meet prescriptive criteria specified as follows for various options. R405.7.1Installation criteria for homes claiming the radiant barrier option. 1.It shall be fabricated over a ceiling insulated to a minimum of R-19 with conventional insulation and shall not be used as a means to achieve partial or whole compliance with a minimum attic insulation level of R-19. Either a sheet type or spray applied interior radiation control coating (IRCC) may be used. 2.If the radiant barrier material has only one surface with high reflectivity or low emissivity, it shall be facing downward toward the ceiling insulation. 3.The attic airspace shall be vented in accordance with Section R806 of the Florida Building Code, Residential. 4.The radiant barrier system shall conform to ASTM C1313, Standard Specification for Sheet Radiant Barriers for Building Construction Applications, or ASTM C1321, Standard Practice for Installation and Use of Interior Radiation Control Coating Systems (IRCCS) in Building Construction as appropriate for the type of radiant barrier to be installed. The operative surface shall have an emissivity not greater than 0.06 for sheet radiant barriers or 0.25 for interior radiation control coatings as demonstrated by independent laboratory testing according to ASTM C1371. 5.The radiant barrier system (RBS) shall conform with ASTM C1158, Use and Installation of Radiant Barrier Systems (RBS) in Building Constructions for Sheet Radiant Barriers, or ASTM C1321, Standard Practice for Installation and Use of Interior Radiation Control Coating Systems (IRCCS) in Building Construction for IRCC systems. 6.The radiant barrier shall be installed so as to cover gable ends without closing off any soffit, gable or roof ventilation. R405.7.2Installation criteria for homes claiming the cool roof option. The cool roof option may be claimed where the roof to be installed has a tested solar reflectance of greater than 4 percent when evaluated in accordance with ASTM methods E-903, C-1549, E-1918 or CRRC Method #1. 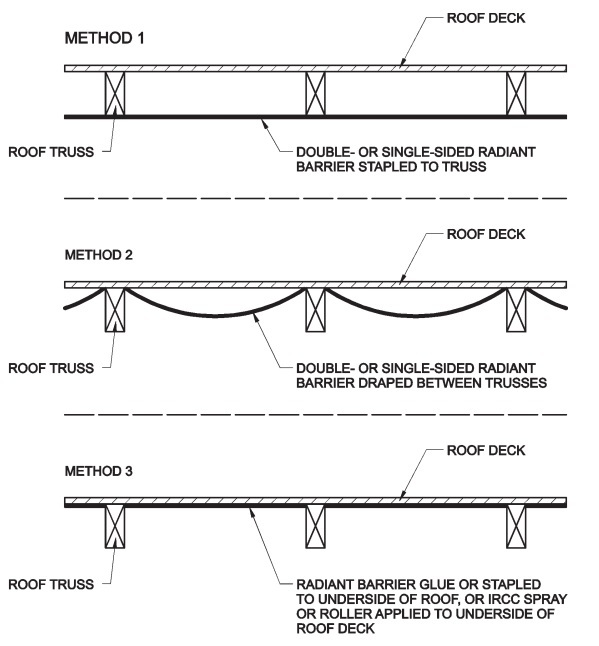 Emittance values provided by the roofing manufacturer in accordance with ASTM C1371 shall be used when available. In cases where the appropriate data are not known, emittance shall be the same as the Standard Reference Design. Testing of a qualifying sample of the roofing material shall be performed by an approved independent laboratory with these results provided by the manufacturer. R405.7.3Installation criteria for homes using the unvented attic assembly option. The unvented attic assembly option may be used if the criteria in Section R806.5 of the Florida Building Code, Residential, have been met. R405.7.4Installation criteria for homes using the cross ventilation option. 1.Operable aperture areas totaling a minimum of 12 percent of the floor area of the room shall be provided for all primary living areas and main bedrooms. 2.Insect screens shall be provided for all operable windows, skylights and doors to be considered operable aperture area. All screened entry doors and interior doors in the ventilated areas shall be provided with either (1) mechanically attached door stops (or similar devices) to hold the door in an open position or (2) operable louvers. 3.The total aperture area shall be provided by a minimum of two distinct windows or one window and one skylight. Each operable unit shall provide not more than 70 percent of the total aperture area. The windows (or sliding glass doors) shall be placed in walls adjacent or opposite to each other. The windows may be placed on a single outside wall if a skylight or wing walls are used. 4.Where wing walls are included in the building design for ventilation purposes, they shall be placed between windows to create a high-pressure and a low-pressure zone on each window. Wing walls shall extend from the ground to eave height, be located on the windward side of the building and extend outward from the building a distance at least equal to one-half the width of the window. NOTE: This technique is effective only for areas that experience significant and continuous winds during the cooling months. R405.7.5Installation criteria for homes using the whole house fan option. 1.The whole house fan has been sized to provide a minimum of 20 air changes per hour for the entire house. 2.The fan installed shall have a free air cfm rating of at least three times the square footage of the conditioned area of the house. 3.To ensure adequate air exhaust, the house attic shall have gable, ridge or wind turbine vents whose total opening area is equal to four times the ceiling cutout area for the whole house fan. Soffit vents shall not be included in the exhaust vent area. R405.7.6Installation criteria for homes using the ceiling fan option. 1.Ceiling fans shall be installed with minimum fan blade diameters of no less than those listed in Table R405.7.6 for the size and shape of the room. 2.Where a primary living area is an “L-shaped” room and the smaller portion of this area is 8 feet by 10 feet (2438 mm by 3048 mm) or larger, a fan shall be installed in both the larger and smaller portions of the primary living area. 3.Ceiling fans shall be ENERGY STAR certified. Exception: Credit shall not be taken for both ceiling fans and cross ventilation. R405.7.7Installation criteria for homes claiming the heat recovery unit (HRU) option. 1.The net useful heat exchange effect shall be demonstrated by either a Form 400D-2017 prominently displayed on the unit with test results clearly visible for inspection or by an ARDM-certified refrigerant desuperheater seal affixed to the unit. 2.The net useful heat exchange effect shall have been determined by an independent laboratory testing to AHRI Standard 470. 3.If more than one air-conditioning system is installed in a residence and only one HRU is installed, energy load shall be based on the gallon capacity of the water heater to which it is coupled and the total capacity of the water heaters in the residence. In such case, the HRU shall be attached to the system serving the daytime primary living areas (family room, living room, kitchen, dining room and adjacent bedrooms and bathrooms). R405.7.8Installation criteria for homes claiming the dedicated heat pump option. The dedicated heat pump option may be used for a dedicated heat pump (also known as a heat pump water heater) installed either with a tank (an integral unit) or without tank (add-on to another water heater) based on the COP or energy factor (EF) of the system on which it is installed. No minimum rating is required for this equipment. Compliance with this section requires that the provisions identified in Sections R401 through R404 labeled as “mandatory” andSection R403.5.3 of the 2015 International Energy Conservation Code be met. For buildings that do not utilize on-site renewable power production for compliance with this section, the building thermal envelope shall be greater than or equal to levels of efficiency and Solar Heat Gain Coefficient in Table 402.1.1 or 402.1.3 of the 2009 International Energy Conservation Code. For buildings that utilize on-site renewable power production for compliance with this section, the building thermal envelope shall be greater than or equal to levels of efficiency and Solar Heat Gain Coefficient in Table R402.1.2 or Table R402.1.4 of the 2015 International Energy Conservation Code. The Energy Rating Index (ERI) shall be a numerical integer value that is based on a linear scale constructed such that the ERI reference design has an Index value of 100 and a residential building that uses no net purchased energy has an Index value of 0. Each integer value on the scale shall represent a 1-percent change in the annual total normalized modified loads of the rated design relative to the annual total loads of the ERI reference design. The ERI shall consider all energy used in the residential building. The ERI for the rated design shall be determined in accordance with ANSI/RESNET/ICC 301, including Addendum A-2015, and be shown to have an ERI less than or equal to the appropriate value listed in Table R406.4. Verification of compliance with Section R406 shall be completed by an approved third party, in accordance with Florida Statutes 553.990 (Building Energy Efficiency Rating System). Documentation of the software used to determine the ERI and the parameters for the residential building shall be in accordance with Sections R406.6.1 through R406.6.3. 2.An inspection checklist documenting the building component characteristics of the rated design. The inspection checklist shall show results for both the ERI reference design and the rated design, and shall document all inputs entered by the user necessary to reproduce the results. 3.Name of individual completing the compliance report. 4.Name and version of the compliance software tool. 2.A certification signed by the builder providing the building component characteristics of the rated design. 3.Documentation of the actual values used in the software calculations for the rated design. Calculation software, where used, shall be in accordance with Sections R406.7.1 through R406.7.3. 2.Calculation of whole building, as a single zone, sizing for the heating and cooling equipment in the ERI reference design residence in accordance with Section R403.7. 4.Printed code official inspection checklist listing each of the rated design component characteristics determined by the analysis to provide compliance, along with their respective performance ratings. Performance analysis tools meeting the applicable sections of Section R406 shall be approved. Tools are permitted to be approved based on meeting a specified threshold for a jurisdiction. The code official shall approve tools for a specified application or limited scope.